Well we start by deciding what sort of 12Volt stuff we’d like to have. It doesn’t matter if it’s an off-grid cottage somewhere, or a small camper-trailer – the process starts off with that same key question – what do I want? Without answering that question first, it’s a bit like heading off on the highway before we’ve decided where we’re going. So let’s get that question answered. When asked “what do you want?” most of us would probably answer with “as much as I can get”, so to help focus that we start to factor in realities like cost, and the other major factor: how much power is my 12Volt stuff going to use? There is a whole blog post on this, and browsing through that will help keep us realistic too. First up is typically a 12Volt fridge – this is one of the “essential luxuries” when we are out and about. The other important 12Volt item is lighting – this means we can see what we’re doing after sunset – like preparing the evening meal. Step 1 starts with creating a wish-list – those 12Volt things that we’d like to have while we’re camping out away from home. Maybe you’ve seen some stuff online, maybe you’ve heard about it from a mate – all that goes onto the list – and if kids are involved, ask them too – carefully managing expectations needs to be a part of that process, but I’ll leave that to you. So now we have a wish-list – that’s the easy part – trimming it down takes a bit of to-and-fro, and generally costs are helpful in trimming things in the first instance. Then there is the power budget – how much power am I going to use in total? This is where we need to be realistic about the limitations of 12Volt power – it can do amazing things with very little, but cooking and heating are usually best taken care of by gas. So have a good look at How much power 12Volt stuff uses to get an idea of the power usage of your wish-list. After a bit of head-scratching the wish-list gets trimmed down to fit within our financial possibilities and also within 12Volt realities. So now we add the power consumption in Amp-hours (Ah) for all the items that we’re interested in. To illustrate this, I’m going to choose my own wish-list as an example, and then follow that through the design process step-by-step with you. So now I put in the power consumption figures, and rough pricing, and start looking at what might need to be trimmed off the list. A 55 litre fridge-freezer – a bit pricey, but must-have, see it as long-term investment. A 1.2 metre strip of LED lights – small consumption, good price, all good. A 12Volt 24-inch TV with DVD & usb – will I be in reception area? Not sure. A 12Volt kettle – price is ok, but slow to boil, nah leave it, just use gas. So for now I’ll include my TV in the power budget and decide later if I really need it – what’s the use of a TV if we’re out camping where there’s no TV reception? So now I’m ready to get a fix on my power budget – how much power is all this 12Volt stuff going to use? Now that the hard decisions are over, it’s pretty easy really – just add up all the power consumption figures. In my case I have 45 + 7.5 + 15 = 67.5 Amp-hours per day. This is probably the most valuable figure to have in any 12Volt design – the daily power consumption. Obviously this is an estimate, and it’ll change with things like weather, how I use my fridge, and so on – but without this estimate I’d have no idea where I’m heading with my 12Volt system. So now I have a decent idea of how much I’ll be using, so I can progress to the next step. Step 2 looks at the battery – this is our energy store, so this will allow us to use the 12Volt power any time of the day – essential really for lights, and to keep my fridge cool overnight, plus catching the evening news on the TV. And this will be a second or “house” battery, so we leave the starting battery just for starting. Sizing a house battery for the system relies on a really simple formula which is discussed in How to size a 12Volt Battery properly. It relies on years of detailed research and comes down to providing 3 days of storage in our battery. In my case I am using 67.5 Amp-hrs per day, so I’m looking for a battery that will store 202.5Ah of energy (67.5 x 3 days = 202.5Ah. And as luck would have it, deep-cycle batteries are measured in Amp-hours too, so I’m in the market for a 12V 200Ah battery. Well that bit was easy enough, but now I have to charge that battery. So now I’m on the look-out for some solar, and possibly other sources like the alternator, or even 240 Volts if & when it’s available. Step 3 is a bit harder, but we’re more than halfway now, and it’s a pretty important part – making sure our battery is properly charged. Another way of looking at is that whatever our 12V stuff takes out of the battery, the solar (or other charger) has to put back, to stop our battery going flat. So with this part we start by looking at the situation where solar is my only source of power. This is often not the case, especially if we’re on the move, but it gives us a good starting point. It also gives us a figure for the case where I want to be fully autonomous – for instance a beach cottage that is off-grid, or when free camping for a while. So to be able to get a figure for my solar output, I need to know about the solar input – the sun – and more to the point, how much am I going to get? That of course leads to the question: Where am I? If I’m in Kununurra I’ll get a lot more than when I’m in Hobart. So in deciding where we’re going to be, as far as solar goes, it’s useful to consider a few past trips, or maybe some of those in the pipeline for the future. 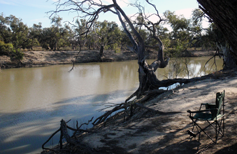 If you have a remote bush-block that makes it easy- you just have one location to consider. But if you’re going to be travelling around, you’d probably want to look at the solar at a few of the likely stops along the way. There are solar figures from BoM for about 100 major locations around Australia in this blog-post. To help us step through this final part of the design process I’m going to use a personal scenario so you can follow what I’m talking about. Let’s say I’m planning to do the Goldfields Loop near Kalgoorlie in WA – and although April is the busiest time there, let’s just say I’m going to do it then. Also I’ll be in Albany for several days on the way back to Perth. So I need to look at Kalgoorlie and Albany for a start. You’ll see the table has annual average hours and winter hours of sun. So Kalgoorlie gets 5.4 hours of peak sun as a year-round average, and 2.9 hours in winter. Albany has less, 4.4 hours year-round, and just 2.2 hours in winter. Obviously I have to cater for the worst-case – having too much solar is never a problem, the regulator will stop it over-charging, it’s undercharging that we want to steer clear of. So Albany it is. Being April I will probably get below the average 4.4 sun-hours, but a bit above the 2.2 winter hours – how about we meet halfway and say 3.3 hours? Right, so I’m getting 3.3 hours of peak sun per day – now what? Well I want to know how much solar I’ll need for my 12Volt setup so that I keep my batteries charged on this trip. Now we cheat a little and go over to the Solar Calculator – actually it’s based on proper formulas so it’s not cheating at all, it just makes it easy – there’s more on the formulas etc. in the blog-post on How much Solar? So putting in my 3.3 hours of sun and 67.5 Ah/day of usage, it works out I need 358 Watts of solar to cover my daily usage and keep my batteries charged properly. Now that I have this figure I can start doing a bit of horse-trading with myself. Will it be 350W or 400 W, or can I maybe get by with less? So, if solar is going to be my only source of power, like when free camping for a week, then around 350 Watts will do it. Now what if I also have an ACR (VSR) or DC-DC charger which uses the alternator to feed my house battery? Well then I can reduce the amount of solar, especially if my stops are not going to be too long. In my example I have an ACR to help charge the house battery while I’m travelling. In my case, if the batteries get low I can start the car and recharge them via the ACR. But I definitely don’t want to be doing that every second day. So how about I go with 300 Watts of solar, and not get too cranky if I have to charge from the car once in a while. And if I’m lucky with the sunshine, maybe that won’t be necessary. So that’s it really – a 3 Step process to design a 12Volt system that will work properly. As you’ll have noticed as we went through the example, it’s never an exact science, which makes it quite easy to get things wrong. But by basing our 12Volt system on some serious formulas and facts, and following things step-by-step, it’s not actually that hard to build yourself a solar setup that will keep everyone happy. The biggest draw by far is going to be the fridge, so let’s concentrate on that, which uses about 85Ah per day. So if your batteries are fully charged when you park up, you can run the fridge for about three 3 days, without any external charge! – like I said, this gives you a great head-start, and in winter (fridge not working hard) you might even get more than 3 days. The DC-DC charger will take about 10hrs to charge from dead-flat to near-full, so again, this is a great choice for charging while you’re travelling along. Now for the solar – and this will depend how much sun you get, so time-of-year, location, etc. For the fridge, summer is the time it’s working hard, so let’s help it a bit by getting in some solar. Using Perth as an example, with 5.4hrs of peak sun on average, let’s say the battery will be supplying half the power and that we want the solar to help with the other half, so about 42.5Ah every day. Putting all that into the Solar Calculator means around 140Watts of solar will do it, so just a single panel. If your slide-on is a pop-top then keeping to 1 panel will reduce roof weight, so lifting the pop-top will still be ok. Also, if going for a frameless panel steer clear of panels that warn about connecting in parallel, etc – not that you will necessarily be going parallel, but the panels with those warnings are dodgy. Didn’t mean it to be so long – sorry! – but hope it helps guide things. You’ve started well, the solar will just be the cherry on the cake! As far as long winded, I could keep reading all day and then some. On the solar, if I’m parked up under a tree in FNQ, how do i rig up a portable solar panel? In parallel or series and connect directly into the Projector or keep it seperate and run through a regulator directly into the batteries? Good question! – and portable solar is a great option – keeps your setup flexible – van in the shade, panels in the sun – perfect! Seeing you have a solar input on the Projecta DC-DC, this acts as the charge regulator, so you can buy a plain (non-folding) panel if you like. But if a folding one is going to save space, all good, and you can then simply bypass the regulator that usually comes with a folding kit (or ask the guy if you can get a refund for it?!). Anyway, you basically just run the cable direct from the panels to the solar-input of the DC-DC – simple, efficient. This is going to be a great 12Volt setup! Thank you for sharing your knowledge. You are one of a kind in todays world and the information in plain english is appreciated also. My question is: How much solar needed to charge batteries given we will be camped for max 3 days at a time. and will the Projecta be well mated for this system.